Railay also known as Rai Ley is a large peninsula between the city of Krabi and beach resort Ao Nang. It is accessible only by boat, due to its high limestone cliffs cutting it off from the mainland access. 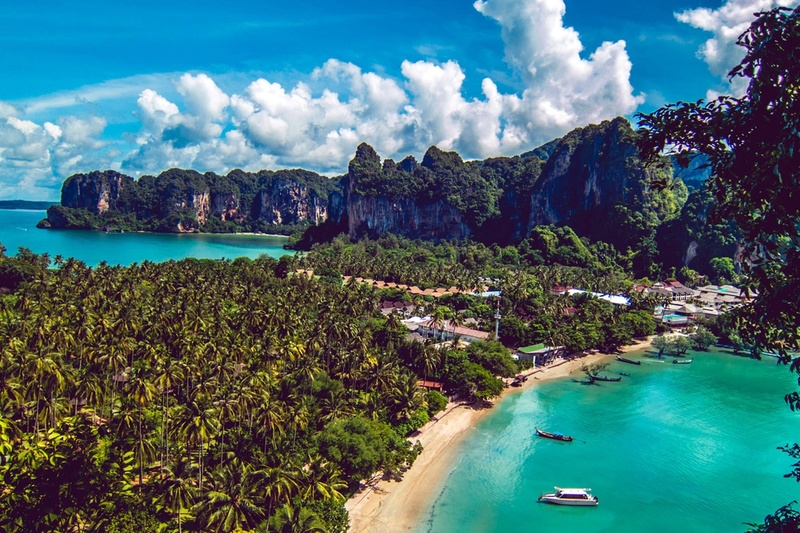 Railay is a majestic peninsula that everyone should visit at least once whilst travelling around Thailand. Stunning limestone karsts and warm turquoise waters makes it a tranquil laid back feel. From the West you can enjoy the fiery orange sunsets and the East beautiful sunrise. However walking from West to East takes no longer than 10 minutes. Only a short walk through the middle of the peninsula, brings you to either side. 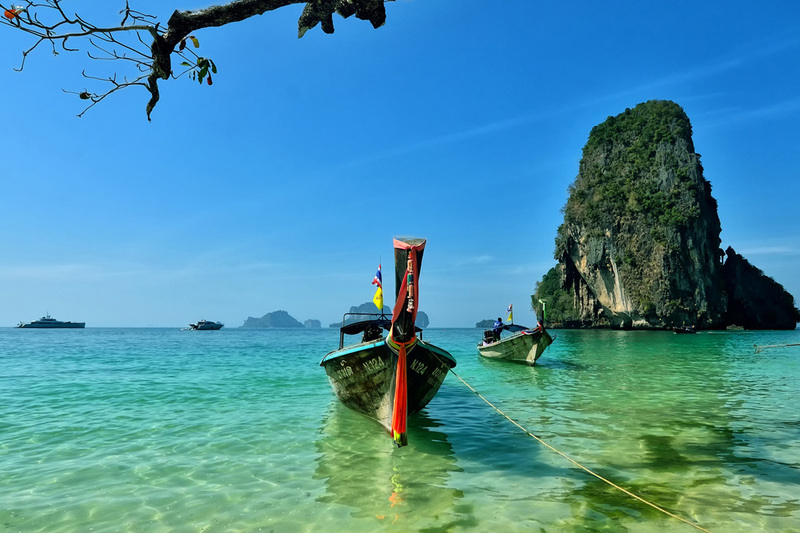 Railay is a charming destination, many relate it to the Avatar movie. The vibe is laid back, super friendly, and instantly feeling the warming of the Thai people as you arrive. Sightseeing can be carried out in 1 full day, leaving lots of time to embrace Railays beauty, and the chilled out atmosphere. West Railay beach – From Ao Nang Pier this will be the pier you arrive via long-tail boat. Railay beach – comes alive at sunset, tourists and locals arrive, and wait patiently to capture its fiery orange/red sunset. Waiting until it disappears then everyone disperses. 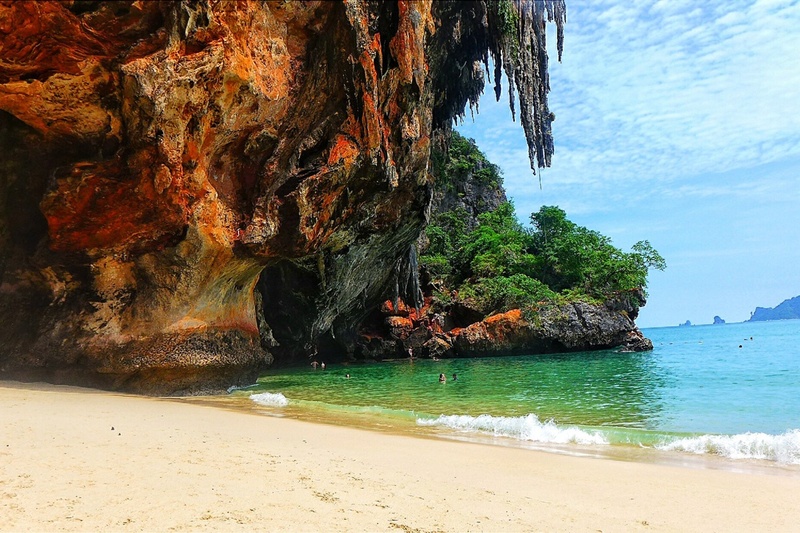 Tonsai beach is approx 600 metres and runs from Railay West, and separated by rugged rock-face cliffs. At low tide it can be reached by foot. High tide it can be reached via a short, but rugged hike over the rocks. Phra Nang Beach The light-coloured sand is fine and soft, the water is clean and clear and the view of the rock cliffs in the background, as well as of the rock island near the beach, is impressive. You can easily swim to this island and there are also large, designated safe swimming areas where you are well away from the numerous boats coming to the beach. The main attraction of Phra Nang Beach is however, the fertility shrines in the cliff faces. Legend has it that Fishermen would visit the Princess cave to bring offerings of wooden phallics to aid in fertility. Getting to Phra Nang beach from Railay East, is a spectacular walk through the cliffs, passing stalactites and stalagmites. From Ao Namao Pier you will arrive at Railay East beach by long-tail boat. Transfers are on the hour every hour 100 baht per person. East Railay beach is for the early risers to capture the stunning sunrise, rising up through the mangroves. This is a splendid area, at high tide the sea comes up to the hotel boundaries, and walkways covered, by shallow waters, and by low tide, mangrove are more prominent. Railay is the place to be for avid rock climbers, or travellers seeking a new hobby then Railay is most definitely for you. Sounds throughout the day, from gibbons, Hornbills , monkeys, monkey around, as they please and abundance of creatures simply living as freely as we.